Note: This page is for version 1.3 of the driver, support for 1.1 and 1.2 are also available. The THB6064AH driver supports BiPolar (4, 6 or 8 wire) motors up to 4 amps/phase at 50 volts. CONTINUOUS! It is based on the new THB6064AH ( Datasheet ) chip (also known as the Toshiba TB6564AHQ^) which is a design improvment over the TB6560, adding support for better microstepping, lower resonance, and protection for power on sequence^. * These are electronics KITs, you need to solder them together. High output current: IOUT = 4.5 A (peak), 4 amp sustained. Optional fan power supply for active cooling in harsh environments. Built-in thermal shutdown(TSD) and over-current detection(ISD) circuit as well as back EMF protection. Automatic idle drive power reduction. (listed for compairison only) 3.5-7 50-80 175-560 Bipolar Freaking magic Cost $80-$166 per axis. Providing a range of drivers is in keeping with our "more is NOT necessarily better" approach. The same is true of motors: Unipolar motors cost less, provide less torque at low speeds, but maintain torque as speed increases. Bipolar motors, only when connected for parallel drive, provide better starting torque, but may not turn as fast and will generally be more costly. Pick the right motor for the job, based on your actual needs. Check out working machines built by our customers, like Alan Redd who says: "I received the kits, built them, and installed them on my lathe today. I was able to follow the instructions and get both drivers put together right on the first try. I have been using a G540, and your drivers seem to have as much power and only very slightly more noise from the steppers. I am still fiddling with the power level and the decay settings, but am very happy with the performance at the current setup." Please do NOT use the schematic to assemble the kit. Please follow the written instructions below . If you are not an expert at soldering, PLEASE read through our soldering class first. PCB 1 The printed circuit board only. Double sided, plated thru holes, professionally made. On the rev 1.3 of the PCB, you can provide the +5 logic power regulator from the motor power supply by adding a powere regulator. This will not fry the THB6064AH they way it will fry the TB6560, because it protects against latch up on start. See the Errata below. The Version 1.3PCB adds two extra holes on the PMinMO connector at lower right so that terminal blocks can (optionally) be used instead of a 2x5 header. In that case, note that the terminals don't carry logic power. And so logic power must be supplied via one of the other options listed below. 1. Long lead / Pin 1 in the square hole. Pin one or the positive lead is always marked on our PCBs with a square hole. On components where pin one isn't marked on the component package, the longer lead is always positive, and we make that pad square on the PCB. 2. Don't solder the component in right next to the PCB; leave a little bit (1/4 inch, 1 mm) of lead. a. This helps prevent the component from overheating when you solder, and during operation. It also gives you some lead to cut if you need to repair the board or if you get the component in the wrong hole. Trying to desolder the leads without cutting them is much more likely to damage the PCB. b. To keep the components off the PCB, insert the leads so that the component is about a quarter inch up, then bend the leads together at that point, crossing them over each other at about 45 degrees. You could also bend them out, but then they would be in the way of the soldering iron, which is almost always coming in from the outer edge of the board. When you turn the PCBover to solder on the back side, the component will fall down to the point where the lead is bent, providing the correct spacing on the component side. c. Solder one lead, stop and check the positioning and that it is the right component in the right place the right way around... then solder the other lead. 3. Work from the inside toward the edge, low components to high components. It's best to solder down any SMT components first, since they are certainly the lowest, then work up and out. Solder a few through hole components in a line if you can, then clip leads and do the next line. 4. It's important to clip all leads as short as possible to prevent shorts to the heatsink. Keep the leads... they become the jumper for the power source and can be used for the test points. anything. Probably the best is made from vice grips and a screw driver tip. If you don't have vice grips, wrap a rubber band around the far end of the handle of a pair of pliers. Or just tape one side of the part down with clear tape! Once the part is held down in position, touch the pad, next to the end of the part, solder, flow, off. Solder one side of each part, check position, solder the other side. 3. [ ] Variable Resistor: This is the drive current adjustment. It can be installed either way but being able to get in there to turn it is the trick. Make sure you will be able to get to it after installing the other components. Take care not to melt the case by letting each lead cool a bit after soldering. If you like, you can even bend the leads on the variable resistor and install it flat agasint the PCB, with the shaft up. External logic power via the PMinMO header: Nothing needs to be done to the PCB, just supply 5 volts via pin 9 (with ground on pin 7 or 2,4,6,8,10). 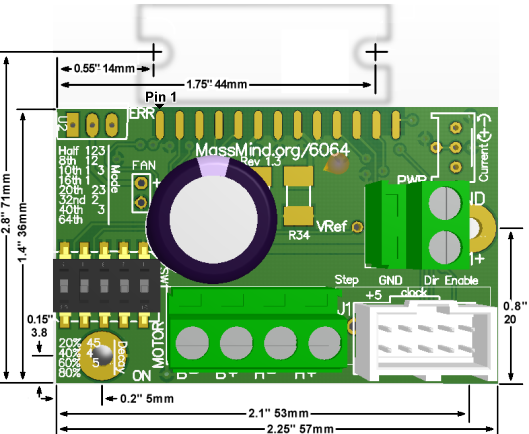 The PMinMO header can be connected to the 4Axis board, or directly to a PC parallel port cable. You can provide power on that PMinMO header from the 4 Axis board, a USB port, or your own 5+ regulated power source. On the version 1.3 board, with VM greater than 35 volts, this is the necessary option. Logic power without fan via VM+ < 35 volts: The onboard 5 volt regulator can supply the small logic current required from VM+ up to about 35 volts^. This is NOT recommended for the full possible 50 volts the drive can accept; in that case, supply external logic power as above. In this configuration the fan connector will be VM+ so the fan has to be able to accept the drive voltage or have a separate supply. For this option, clip off part of a lead from the large capacitor to short the two pins of U2 furthest from the edge of the board (nearest the "ERR" silkscreen) as shown here: TODO: Picture. Keep in mind, you will be applying >9 volts to VM+ when testing logic power below. FAN Power regulator (Option): To use the FAN connector on the PCB, you need to install the large TO-220 LM317HVT or AHVT. This can manage the up to 50 volt motor supply and produce 12 volts at a high enough amperage to run most CPU fans. ERRATTA: There is an error in the values populated on the version 1.3 board: R8 is 240 ohm and R9 is 680. This results in the output of the regulator being 5 volts, which will not provide enough headroom for the already polulated LM7805 regulator to generate logic power. R9 must be changed to 2K2 ohms. If you do install the onboard logic power regulator option, the LM317 goes in U2, with the tab towards the outside of the PCB. The tab must be electrically isolated from ground, so a mica insulator must be installed between the tab and the heatsink, and a shoulder washer should be used to keep the mounting bolt from touching the hole in the tab. Keep in mind, you will be applying >16 volts to VM+ when testing logic power below. 5. [ ] VRef Test Point: Form loops from a couple clipped leads and push both ends into the hole for the VREF test point just behind the motor power terminals. 6. [ ] Jumpers: When you solder on the 2x5 header for the options jumpers and the shrouded 2x5 PMinMO header, it's a good idea to bounce around in the pin order rather than just going down the line. It keeps the plastic from getting soft and perhaps not holding the pins straight. If you have the mating female connector handy, plug it in while soldering. Note the notch in the shrouded header is away from the edge of the board. 7. [ ] Terminal Blocks: Slide two of the three terminal blocks together so that the rail and groove interlock. 4. [ ] Capacitor: The large electrolytic cap goes in with the long lead in the square hole, and the stripe side towards the round hole. It can be installed all the way down on the PCB for physical stability. And it's probably best to set it aside and come back to it after you have done all the other components. Save the clipped off extra leads for use as jumpers in the logic power section. Assembly time to this point is about 20 minutes. 11. [ ] At this point, without the chip installed, do a visual inspection, preferably with a magnifying glass. If you want to be extra careful, you can check the resistances to ground at the pads where the main chip will be soldered on. Note: This table assume no option jumpers are in place. If they are, the DCY# and M# pins will be <0.2 instead of 12K. Pin 1 is on the left looking from the top with the chip away from you. Normal readings are not exact. *Pad is the pad count on that side. 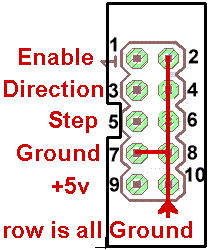 If using PMinMO header, apply 5V logic power at pin 9. Otherwise, apply motor power to VM+. Now the 5V logic power system can be checked, the +5v led should be on and the Vref can be measured and adjusted to a low value: 0.4-0.5V. Power off and prepare for finally assembly. 12. [ ] The big THB6064AH chip: Since this product has a MOS structure, it is sensitive to electrostatic discharge. 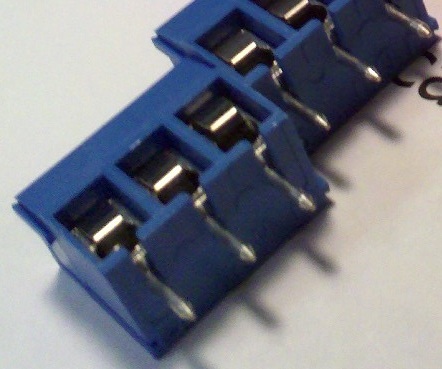 These ICs are highly sensitive to electrostatic discharge. When handling them, please be careful of electrostatic discharge, temperature and humidity conditions. Wear a grounding strap when touching the chip and work on an anti-static surface. The IC fin is electrically connected to the rear of the chip. If current flows to the fin, the IC will malfunction. If there is any possibility of a voltage being generated between the IC GND and the fin, either ground the fin or insulate it. We recommend that you directly connect the IC to the heatsink, and ground the heatsink. Mount the chip and PCB using 3 #4-40 or M3 screws. Temporarily mount the chip to the heatsink first. On a large heatsink, you should also mount the PCB with a spacer to raise it up a bit so it won't short out underneath. Spacer height can be about 0.1 inch or 3mm. You can use an M3 or #4-40 nut, a stack of washers, or cut off a bit of tubing like an old bic pen barrel. If the heatsink is smaller than the PCB, like our little CPU coolers, just mount the chip in the center of the heatsink and secure the PCB to the cabinet next to the heatsink. Slide the PCB between the chip's pins, align it carefully, and screw it down. The wide point on the outer pins should be just at the edge of the PCB. Any farther in, and the pins will start to spread apart and not lie flat on the pads. Make sure all the pins are flat on the pads so the solder will flow nicely over the length of the pin and form a strong connection. Bend them carefully if needed. 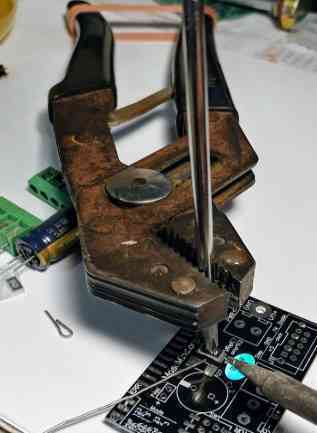 Solder one pin by placing the tip of the iron on the pad near the pin and let the solder flow around and under the pad. Check placement, alignment, and orientation and then solder down the rest of the pins. It's a good idea to bounce around and pause once in awhile to keep the heat from building up in the chip. Between chip pin 5 and 5v+: ~4K5 to ~2K3 as the trim pot is turned. Between chip pin 5 and GND: ~470 to ~4K as the trim pot is turned. Finally, reassemble with a bit of heatsink paste under the chip. That paste makes a huge difference in high temperature operation. 13. [ ] Apply only the +5 volt power again, verify the power LED lights and nothing gets hot. 15. [ ] Set decay and mode by adding or removing jumpers. You might start with only 1 and 5 jumpered: 60% decay and 16th microstepping. 16. [ ] Verify the current control potentiometer is set all the way to the lowest setting. Apply logic power first, then motor power. The motor should lock, but not turn. Make sure the drive chip and motor are not heating. Carefully adjust the current setting to 30% of the motors rated capacity. Why only 30%? Because when the motor is not turning, the driver is in idle and as soon as it gets a step pulse, it's going to increase the drive power automatically. Please do NOT measure the current via the +VM or positive motor supply lead: Because this is a chopper driver, the current measured at the +VM line is much lower than the actual motor; as much as a quarter to a fifth the actual current; to set current limit, you must measure VRef voltage. For example, when Vref = 2.4 volts, Io = 4 amps (max) and when Vref = 0.5 volts, Io = < 1 amp (minimum). When at rest, the actual Vref for Io = 4 amps (max) will be 30% of 2.4 volts or 0.72 volts. So to set for maximum amperage, while the motors are at rest, adjust Vref to 0.72 volts. For Io = 1 amps (min), when at rest, Vref should be adjusted to 30% of 0.5 volts or 0.15 volts. Attach a voltmeter (or multimeter in DC volts or "V=" mode) with the positive lead to the Vref test point and negative lead on ground. Verify the current control potentiometer is set all the way to the lowest setting; the lowest voltage on Vref. Apply motor power. The motor should lock, but not turn. Make sure the drive chip and motor are not heating. Now turn the potentiometer until your meter reads the correct voltage for Vref when resting. 17. [ ] Now connect the step and direction signals and spin the motor. These should be < 0.8V when low and > 2.0V when high. The Vref reading should increase to your desired amperage setting divided by 1.667 while the motor is in motion, and drop back down when you stop it. Let it work for at least 10 minutes to verify that nothing is overheating. Power off and try different decay settings for smoother operation. Can I use Repetier firmware with this driver? I need to connect the motor Nema34 to Ramps 1.4. Network recommend to use your project. Today I need 2 driver. I need driver in assembled condition. Still need adapters cable Pololu. Tell me, is it enough to work, or will need something. I am ready to pay today. What are the dates of dispatch and delivery to Russia? I'm building a 24x30" wood router. It will have plastic linear bearings (8020 style), 5 start 10tpi acme screws. Motor torque requirements come out below 100 oz-in for several methods, including the one here. Why do people use 300 oz-in motors on machines this size? I realize torque drops with speed. I like the looks of your 4A driver. Does your driver include any input for router stop or speed control( thru appropriate means, of course). TakeThisOuTddg2STOPspam at live.nl asks: " how to connect to mach3 ? are the input pin's of the tbh6064ah Active when they are connected on GND ? Thanks, I love to hear from you" + James Newton of MassMind replies: We have some info on setting up with Mach3 here. Each input is different. Direction is CCW when high, Step takes action on the rising edge (from low to high), and Enable is active high." James, i was looking at the BoB and I see you do not use optocoupler input/outputs which seems normal on others I have looked at, is there a reason for this? I will be using it with Linuxcnc, do you have recommendations for step & hold timings etc. Why is that 4 10k resistor pulling the motors output to ground, not better a diode or nothing connected? Why those 10k and 100nf parts in the reset pin, why not link to +5V if the device claims to be safer than TB6065? Thank you! 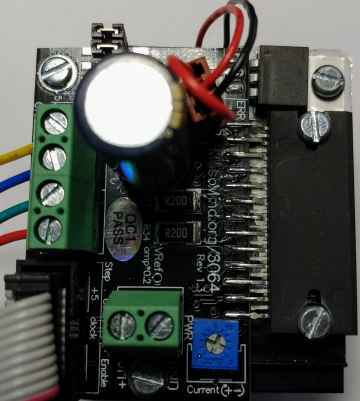 good day, your 6064 Stepper Motor Driver / breakout / cables 3 AXIS FULL KIT! $ 120.90 is already assembled and welded? already has the sink as in the picture? there is already an adapter cable for ramps 1.4? Hi james, forgive my ignorant question of electronic, but is it possible, with ramps 1.4 and marlin, move 3 axis, and then 3 stepper motors of my 3d printer, with the kit "3 AXIS FULL KIT"? ?If no, what else (or less) I need? Thank you in advance.